I feel a sense of loss at this change – it was expected so I don’t understand why it seems to hit so hard that it is over – I can only suppose it is because I shall never be taught by Ms D again, never bake or cook with friends in that atmosphere and never feel the pride in having a connoisseur smile and say the food you made tastes good – I will miss it all. 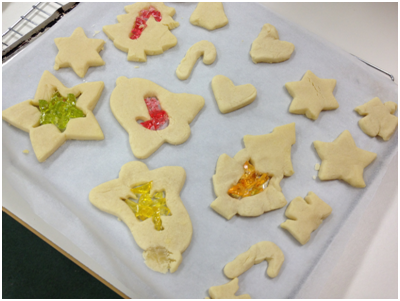 As a parting gift, a tradition of Ms D, she baked us these wonderful gingerbread people. She customised them with our name and made it a boy or a girl, accordingly. I ate mine as soon as I got home (after photographing of course! 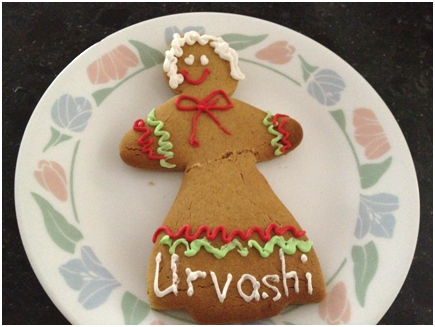 – though I was tempted…) and it was the sweetest and most delicious gingerbread person I had ever eaten. In my life now, I will always associate her with these biscuits and I think that is beautiful. Well, look at me getting all sappy and not even moving onto honouring my last food tech lesson with a shebang post about it! 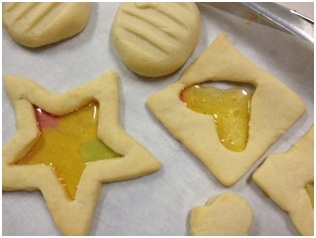 These stain-glass window cookies were amazing – simple as that – no lies, no exaggerations I promise. The shortbread, while made with a recipe which seemed very strange at first, was soft and moist with a delicious traditional flavour. I definitely must emphasise though the importance I place on refrigerating this dough – you see, we did not have a spare half hour lying around and we must have used an extra half cup of flour just to make the dough not stick to the rolling pin and easy to cut!!! Also, on the baking time, we added approximately 2 minutes onto both the initial 5 minutes and the latter in order to get a nicer golden brown! 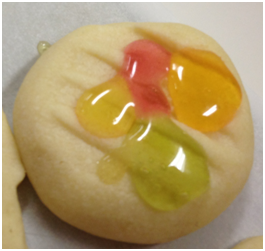 A last tip (since I don’t think any adaptations are necessary) – use a variety of essences or zests (which we actually discluded) in the cookies and when breaking the boiled sweets, cutting them into small pieces makes it easier as crushing often makes a powdery substance hard to handle and which is colourless! So, I give you the final baking from my school to yours (unlike Dorie Greenspan’s Baking From My Home to Yours) – Enjoy mes amis! I can completely understand why you will miss the food tech classes. We go to school and spend a lot of time learning things that do not reflect our passion, but when we come across something that does it is hard to let go. 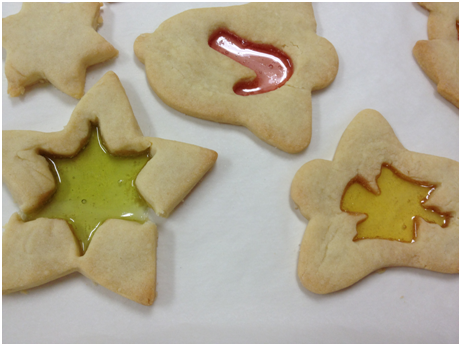 These cookies do look stunning. I have never made ones like these and they look to be a nice change of pace from all the chocolate during the holidays. Yum! Have a great day. I hope your season preparation is going fantasticly!